Property 14: Briarwood Cabin, overlooking Lake Norfork near Mountain Home, Arkansas. 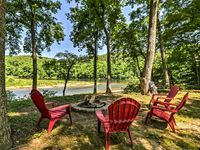 Property 15: Fall Creek Cabins family friendly 1 mile from Lake Norfork and Mountain Home Ar. Property 17: Fall Creek Cabins family friendly 1 mile from Lake Norfork and Mountain Home Ar. Property 19: Cozy Waterfront Cottage w/Deck on the White River! Property 24: Fall Creek Cabins family friendly 1 mile from Lake Norfork and Mountain Home Ar. Earth Home Retreat - Dusk Cottage #5 - A View and Footpath to the Lake! Property 27: Earth Home Retreat - Dusk Cottage #5 - A View and Footpath to the Lake! Woodland Retreat on 500 Acres lets you enjoy the great outdoors. Property 28: Woodland Retreat on 500 Acres lets you enjoy the great outdoors. Welcome To Our Cozy And Private Ozark Mountains Cottage. Property 29: Welcome To Our Cozy And Private Ozark Mountains Cottage. Property 30: Fall Creek Cabins family friendly 1 mile from Lake Norfork and Mountain Home Ar. Property 31: The Hidden Cabin located minutes from shopping and the lake! Cozy new cabin with all you need, beautiful lake view near Buzzard marina. Property 32: Cozy new cabin with all you need, beautiful lake view near Buzzard marina. NEW! White River Cabin w/Decks, Game Room & Views! Property 39: NEW! White River Cabin w/Decks, Game Room & Views! Property 43: NEW! White River Fisherman's Lodge w/Guided Trips! This place is awesome. Very private and beautiful. Also so relaxing. Only a mile from Wal-Mart and local restaurants. Very clean and beautiful view of river! Nice cabin! The only thing I would change is getting another couch so all occupants can sit in the living room together without some having to sit on the bed.